Both airports have been closed, suspending all flights in and out of Bangkok. 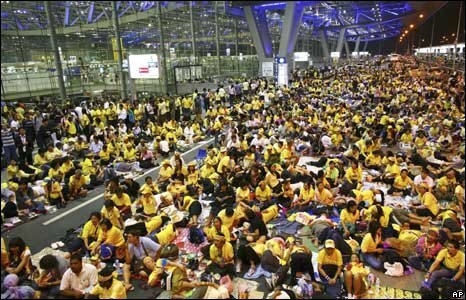 People’s Alliance for Democracy (PAD) demonstrators have been camped out in the departures wing for two days. The army chief has called for fresh elections, but the prime minister refuses to step down. And he has just declared a state of emergency. Life as usual in Bangkok? It seems that the royalist demonstrators, in their yellow shirts, were ready to up the ante when almost all had dismissed their cause as unwinable. Their activity at the government offices in the past few months seemed to be dissipating. But their goal of forcing the resignation of Prime Minster Somchai Wonsawat, the brother-in-law of disgraced former premier Thaksin Shinawatra and a man they see as a proxy for the exiled former leader, is one they will not abandon lightly. 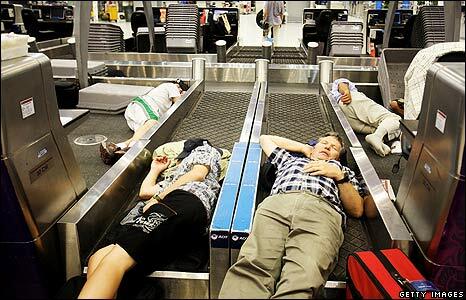 Thousands of travelers have become stranded in this tropical city and fellow Americans will miss Thanksgiving _ and their turkey comas (not this American incidentally. I happily write this with a belly full of turkey, mashies, cranberry sauce and stuffing). Despite the turmoil though, life in Bangkok continues as usual. There are no yellow-clad PAD demonstrators on the streets. Nor are there groups of red-shirted pro-government demonstrators. One unaware of the crisis would not find evidence of it in daily life. But the confrontation is not one that will abate easily or quickly. Tonight there have been rumors that pro-Thaksin supporters would demonstrate on Sukhumvit, a main drag and a popular neighborhood for expats. There have also been rumors that the army will start deploying tanks in the streets to keep order if conditions worsen. And rumors of another coup, like the bloodless one that ousted Thaksin in 2006, abound. There is no telling how or when this upheaval will be resolved. The democratic election of Somchai is being vigorously challenged and PAD demonstrators say they will not abandon their cause unless he steps down. The truth is, this is a vicious pattern. My fellow Bangkok residents hope the situation will abate, but it is indicative of a larger class divide and deep anger on both sides. We are safe for now, but the uncertainty over how this crisis will be resolved is making even the most non-alarmist among us a bit nervous. On another note, I promise to post about my China trip and my climb up Mount Tai Shan in the coming days. Unfortunately my blogging capabilities in China were, err shall we say, hindered by the good People’s Republic’s ideas of media freedom. This entry was posted in Politics and tagged Bangkok, China, coup, Don Muang airport, PAD, protesters, Suvarnabhumi International Airport, Tai Shan, Thailand, Thanksgiving. Bookmark the permalink. My husband and I are planning 2 week vacation in Thailand (Bangkok, Chiangmai, Phuket) leaving the middle of Dec. Do you feel safe? If the airport opens, do you think it’s safe for travelers? Take care of yourself and keep us posted! Don’t be hating on China just because the country is cracking down on free-thinking radicals like you!